A familiar sound in the studio or lab during college classes is the collective groan from students when they find out that they have to do some real reading. This is a real problem now in education - that the current generation of learners, most of whom have grown up with email, wikipedia and social networking, are simply not used to extended periods of exploratory reading away from a computer screen. But particularly for students of visual communication, its important to realise that most of the principles and elements of graphic design were formulated, developed and standardised long before the digital revolution and the arrival of Adobe's Creative Suite. 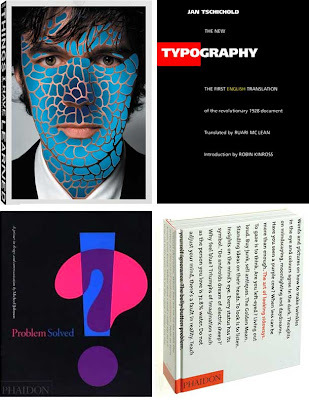 And like any other discipline or cultural movement, there are a few key authors and texts that are essential reading for anyone wishing to pursue an education and a career in graphic design. In literature for example, the Beats had Kerouac, Burroughs and Ginsberg. For rock music, think Greil Marcus, Stanley Booth and Lester Bangs. And for typography, look no further than the likes of Jan Tschichold, Emil Ruder, Karl Gerstner and Paul Rand. Unfortunately, books by these authors are often out-of-print or very expensive. For example, you will need to fork out upwards of £100 for a new copy of Rand's seminal book A Designer's Art, and I posted back in 2009 about Gerstner's 'Die Neue Graphik' which will set you back £150 for a secondhand copy. I have a few of my own suggestions for essential reading in visual communication. Some of them are key texts, others less so, but in an ideal world they'd all be sitting on the shelf in your studio.